"It will be intelligent, and it will make you think." The Vampire Chronicles by Anne Rice was a significant departure from the regular treatment meted out to the undead. Sans garlic and holy water, Anne Rice's vampires were thoughtful, melancholy with oodles of character. I loved the series, at least the first four before Rice decided to take the series all theological. 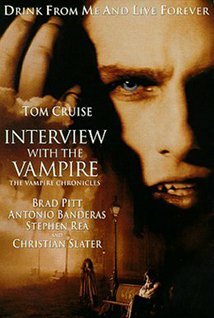 Interview with the Vampire, was not on the first book of the series, it was also the first of the Vampire Chronicles to be made into a movie. As an adaptation, the screenplay predictably falls short of the novel, both in terms of the story and the depth of the characters themselves, not to mention the deviations from the original storyline. As if to compensate, the movie is stuffed chock-a-block with stars, in a desperate attempt to make up for lost story. Brad Pitt plays Louis, the sentimental plantation owner from New Orleans. Tom Cruise is Lestat, the Paris born commoner that converts Louis into a vampire. Antonio Banderas is Armand, the coven leader in present day Paris. Kristen Dunst, as a young girl, plays Claudia the baby vampire. Tom Cruise fails at being Lestat. Lestat of the book is impulsive, cheeky and bold, having slayed an eight-wolf pack to get the attention of Marius, his maker. In the movie Tom is instead immature and lovelorn. Brad Pitt manages a much better Louis, especially in exploring his love-hate relationship with Claudia. Kristen Dunst shows moments of steel in playing the child vampire, but at the end comes off more as a child than a grown woman stuck in a child's body. The interactions between the characters is theatrical, the whole movie taking on tones from Théâtre des Vampires - loud, dramatic and over the top. The first two novels are all about Lestat, his drives, his motives, his idiosyncrasies. Unfortunately getting that character wrong spells the death knell for what could otherwise have been a much more powerful rendering of The Vampire Chronicles. That is not to say there are no redeeming aspects. Mood and music are captured pretty well through out. There is a consistent use of smokey backgrounds with harshly lit foregrounds, emphasizing the spotlighted nature of the movie. The music adds to the feeling of introspection. Queen of the Damned has one of the best soundtracks, if you are into that kind of music. From the devastatingly soulful "Forsaken", the mournful "System" to the thunderous "Cold" by Static-X, the background is filled with metal ballads that can cause chills go up your spine. Unfortunately what happens on screen quickly dampens all such emotional reactions. Instead of a movie remotely following the cue of the novel, what we get is a mix of spoofed Gothic sub-culture and the least vampiric of all vampire movies. One could have replaced the vampire with any other folkloric creature, and the movie would have made just as much sense. To begin with the good - casting Lestat. Stuart Townsend is a much better choice for the brat prince. The flashes of arrogance are more Lestat than Tom Cruise ever was. The music is a close second, for successes with the movie. Pretty much everything else works against it. The story, suffers from telling too little. It meanders from act to act without much of an explanation or background story. What little explanation there is seems to have been added in during editing. The Queen of the Damned is supposed to be about the origins of Rice's vampires; the movie is the story of the concert and a deranged super-vampire. A super-vampire that inexplicably causes other vampires to combust, likes Heavy Metal and for some reason dislikes a bunch of other vampires that live in a castle. These other vampires are the protectors of something and want to save humanity. Oh, then there is a mortal, the niece of one of these protector vampires that is part of a rich group that follows vampires without being seen. As I said, the story is light on details. The acting is uneven. The effects, lacking subtlety, are awful, intruding into the main narrative as if someone just discovered a new piece of FX gadgetry. The background vampires are a sad excuse, especially compared to Rice's introspective over-analyzers. And funnily, there are too many aerial setup shots. Every couple of minutes there is an aerial shot, a new town, another aerial shot, a new city. Enough to stick out like a sore thumb, and hurt. Queen of the damned comes off as a stylized vampire derivative. There are other stylized vampire derivatives that came about in later years that unfortunately beg comparison to. The more I think of the movie, the more it reminds me of the trailers of - dare I say it - the Twilight series. With the Queen of the Damned movie, the tale of the origin of the vampires is dropped for a romanticized fight between über blood suckers. That, dear vampires, is the quickest path down the Twilight zone. This work by Ravi Kiran Nagavarapu is shared under a Creative Commons Attribution 3.0 License.